The ultraviolet part of the light spectrum is responsible for causing the large majority of fading of artefacts and furnishings caused by the sun. Specialist UV Window Film can reduce UV transmission by up to 99.5% prolonging the lifespan of paintings, carpets, goods and displays. The three main factors of above cause somewhere in the region of 90% fading. Clear UV Window Film from Sureguard Window Film® can reduce the harmful UV rays by 99.7%. The effects of UV radiation can be expensive. It can cause colours to fade in both soft furnishings and artefacts. Clear UV window films filter out approximately 99% of this UV light, making it ideal for shops, museums and other display areas. All UV Window Films from Sureguard provide up to a 99% reduction in UV transmission, meaning that tints and colours are also available. 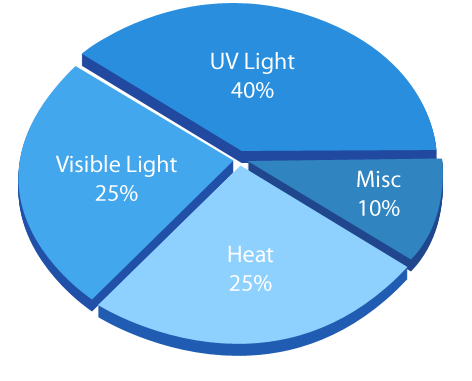 Our Clear UV Window Film offers protection at the crucial end of the UV spectrum (up to 380nm and 99% of the UV in the range 300nm to 400nm). Sureguard Window Films® installs specialist fade protection Window Films, specialist museum Window Films and energy control Window Films throughout the UK. Every installation includes a manufacturer backed warranty for between 5 and 15 years. The use of this product reduces the effects dramatically. Clear UV Window Film from Sureguard Window Films® will not eliminate fading caused by UV, however the effects of fading are greatly reduced.